The man who has Shraddha, is diligent and has control over the organs, attains Self-Knowledge. Shraddha is translated in English as faith. Though the meaning encompasses faith, the real import of Shraddha is much more than that of faith. Shraddha is defined in the prakarana grantha,Tattva Bodha, as ‘गुरुवेदान्तवाक्यादिषु विश्वा्वासः श्रद्धा’ (Guru vedantavakyadiṣhu visvasaha shraddha) i.e. ‘Faith in the words of the Guru and in the Scriptures’). Swami Paramarthananda explains that this faith is not blind faith but “a non-critical open-minded approach giving the benefit of the doubt to the teacher or the scriptures until I understand. That humility, Shraddha involves, implies freedom from intellectual arrogance. Intellectual arrogance is a very big obstacle for scriptural studies”. Further Shraddha enables one to look upon Sastras as a Pramana, a means of knowledge, and have faith in Guru Upadesa and only with this positive attitude along with devotion and sense-control one can attain Self-knowledge. That is why Sri Sankara defines Shraddha as ‘asthikya buddhi’, positive frame of mind. The positive frame of mind in this study is that one has faith in the existence of the thing one seeks to know and in the validity of the means of knowledge one employs and on one’s ability to know, free of cynicism or skepticism. In the West, faith is also narrowly interpreted to mean one’s religion. The usual meaning of faith is that which one has belief in, with conviction. Trust, confidence, belief, expectations, assumptions and inferences are all aspects of the usual meaning of faith. So there is no person without faith and this faith influences one’s vision of life which in turn influences one’s thoughts, actions and desires. True faith is self-existing. It is sustained by itself either by intuition or belief, but rarely needs an external proof. Reason may sustain faith; but true faith needs neither proof nor reason, only belief in the thing to be true. In Hinduism faith in God, scriptures, Guru, Dharma, Karma, Moksha etc., are upheld as highest virtues. Since God is invisible and beyond the scope of verification by the senses, Hindu tradition lays down that Vedas are the means to know Him and his Laws like Dharma and Karma, holding Vedas as the God-given manual for the conduct of human life. Since they are not subject to rational or empirical verification, one has to have faith in the scriptures, in the practice of Dharma and in striving for Moksha. The Brihadaranyaka Upanishad (3.9.21) declares that the resting ground of faith is the heart (Hridaye eva Shraddha prathishtitha bhavathi). 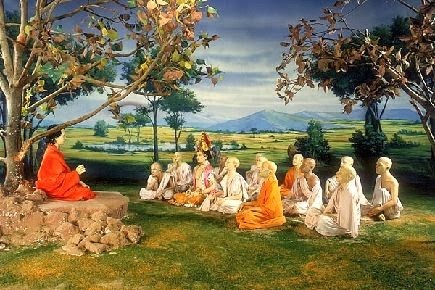 Faith sustains devotion and devotion is necessary along with Jnanam to attain Liberation. And one needs faith as Shraddha not only in the practice of religion but to gain proficiency in any field. As faith influences one’s thinking and action, it also influences one’s behaviour. So Lord Krishna states in Gita(17-3), using Shraddha in the basic meaning of faith only, “as a person’s Shraddha is, so is the person” (yo yacchraddhah sa eva sah). Threefold is the faith of the embodied beings, which is inherent in their nature; Satvic, Rajasic and Tamasic. Hear about it (now). Lord Krishna classifying faith in three groups, Satvic, Rajasic and Tamasic, goes on to enumerate how it is reflected in their life-style; performance of worship and sacrifices, in food habits, austerities and charities. Let us see this in respect of worship, sacrifices and austerities. Satvic person worships, performs sacrifices and observes austerities, all for a higher goal. His/her faith is selfless and free from expectations. A Rajasic person worships, performs sacrifices and observes austerities, all for a selfish goal. His/her faith is selfish and conditional. A Tamasic person worships and performs sacrifices without any sincerity, more as a routine and even with a harmful motive. His/her faith is manipulative and destructive. Shraddha comes under Satvic faith as the person’s actions are oriented towards the higher goal of Moksha and towards Jnanam that is the sadhanam for Moksha. So we can give a simple definition to Shraddha as Satvic faith with a positive frame of mind. And it is the Shraddah that is the motivating factor when we undertake any kind of action for the first time that gives us the confidence to succeed, even for the votaries of science who swear by reason only. Shradhdha has so much of meaning and import. Great enunciation. Thanks and congrats.